YOUNGSTOWN, Ohio – Last summer, the president of Youngstown State University’s Student Government Association, Ernie Barkett, had his third heart surgery. Growing up, he said, his family didn’t have health insurance and he saw the burden it put on his family. It was with cases like that, he said, that make it so important for YSU students to have the on-campus office, especially considering that it’s just $34 per semester. 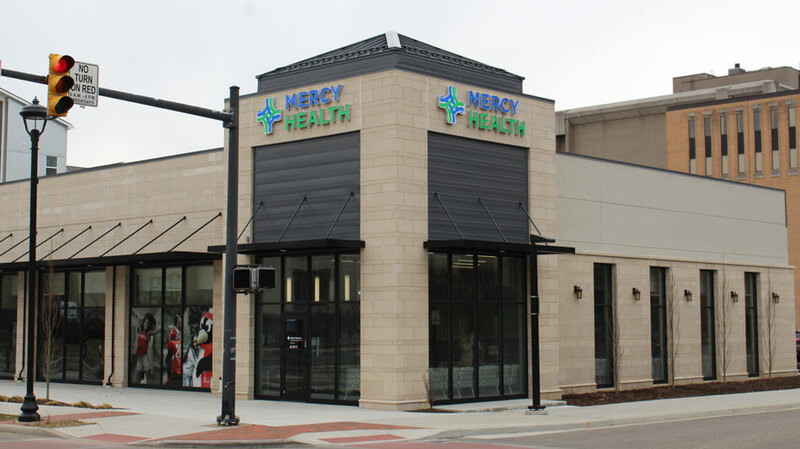 When Mercy Health made the decision to open the office, among the chief considerations was developing a setting that students would want to use, said Dr. John Luellen, Mercy Health-Youngstown president. Getting students through the door in the first place, added Dr. Ashley Baroff-Rufo, is key to improving health for the student body, as well as the rest of the community that uses the office. That low cost of care – the fee covers all services available at Wick Primary Care for YSU students, regardless of insurance – is also key in ensuring access, Luellen and Barkett agreed. Student support for the primary care office has been overwhelming, Barkett said. When a measure deciding whether or not to approve the $34 fee for the center was voted on by students last school year, nine in 10 voted in favor of it, he said. The move by SGA to help expand health care on campus is just one of the moves to improve the quality of life for students, he added. The university also offers the Career Closet, where students can get clothes to wear to job interviews if they don’t have any, and the food pantry, which this school year added a refrigerator and freezer to expand its offerings. Wick Primary Care has four full-time staff, a student employee and 10 doctors of varying specialties that will rotate through the center at the corner of Wick and Lincoln avenues. Among the range of services available are immunizations, sports physicals, nutritional care, gynecological services and psychiatric care. “For too long, people have drawn a separation between physical health and mental health. We’re trying to break down those walls and see the wellness of the individual front and center. By merging the two, it’s very natural in this setting,” Luellen said. Prior to Wick Primary Care, the student-health clinic was in Kilcawley Center, where it had been since the 1980s. Mercy Health-Youngstown began operating the clinic in 2016 and last year had more than 5,000 visits. Pictured: Pete the Penguin, Youngstown Mayor Jamael Tito Brown, YSU vice president of student affairs Eddie Howard, Mercy Health-Youngstown President Dr. John Luellen, YSU Student Government Association President Ernie Barkett and Dr. Ashley Baroff-Rufo cut the ribbon on the new Wick Primary Care office.